The experiences of the author's daughter was the inspiration for Powerful. When the child was three years old, she was bullied at school; and her mother, Alicia Thomas-Woolf, was desperate to help her. The teachers saw the little girl go from a happy-go-lucky child, to a broken and miserable one; then they saw a remarkable turnaround. This is not normal–generally, when a child is broken, that’s how they stay. They asked the author how she turned her daughter around (and so quickly!) and she explained: "In a nutshell, I focused on giving my child the emotional tools she needed to know how to deal with her emotions." She had crafted a simple NLP process suitable for very young children, wrapped it in a song, added action with NLP moves and power poses, then tied it all together in narrative for context; and the rest is history. Three years later, (two of which is how long it took to publish this book & CD) Thomas-Woolf's daughter is still 100%. The school has implemented the book into their syllabus and numerous other schools have invited the author to speak to the teachers, the older kids and the younger ones. Some more have also implemented the book into their syllabus. Thomas-Woolf is only too happy. "I feel that Powerful is my legacy. This is a tool that can really make a dent in bullying all over the world. How wonderful is that?" 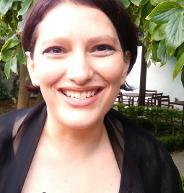 Alicia Thomas-Woolf is a South African publisher, author and singer-songwriter (under the artist name mist tree). She is happily married to her first husband and together they have 2.3 children (a girl, a boy and a cat). The cat is not even remotely interested in Powerful. You can read more about Thomas-Woolf's work on her website, her life on her blog and even discover her favourite books. 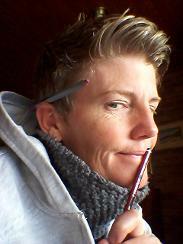 Karin Arbuthnot is an illustrator, artist, designer, landscaper, photographer and volunteer firefighter. She designed ada enup's logo in 1999, created the coat-of-arms for Amazizi: the Dlamini of Southern Africa, illustrated Lana Jacobson's A Good Night's Sleep (the first book in the Taboo Topic series,also published by ada enup) and is currently working on Powerful II-The Dog's Life, the next book in the Powerful series. She lives in Cape Town.